Some yeasts and molds that are common in the environment can infect humans and cause a range of diseases, from superficial (e.g., athletes foot) to severe (e.g., cryptococcal meningitis). These pathogenic fungi pose a particular threat to immunocompromised individuals, such as those living with HIV/AIDS, and are becoming a leading cause of morbidity and mortality worldwide. 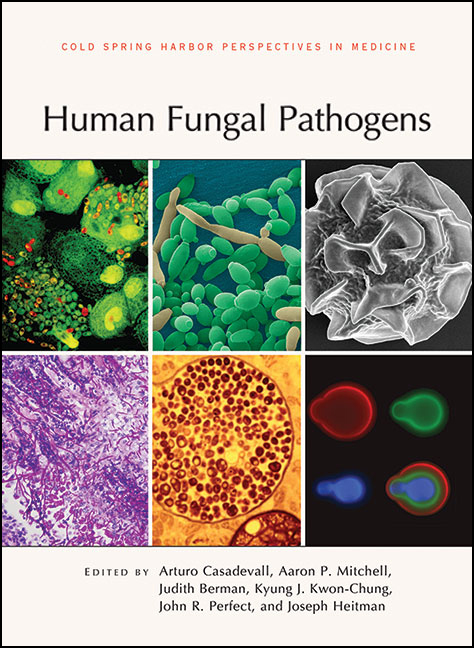 Written and edited by experts in the field, this collection from Cold Spring Harbor Perspectives in Medicine provides a comprehensive review of the biology and diseases of fungal pathogens. Contributors examine their life cycles, nutritional and metabolic requirements, and morphological characteristics, as well as their interactions with humans—their modes of dissemination and penetration, the mechanisms they use to evade the immune system, and their effects on target organs. Specific chapters are devoted to the major disease-causing fungi, such as Candida, Aspergillus, and Cryptococcus species. The ecology, evolution, and epidemiology of human fungal pathogens are also explored. This volume includes discussions about options for diagnosing and treating fungal infections, as well as challenges presented by emerging drug-resistant strains. It is therefore an essential reference for all fungal biologists and medical professionals who wish to understand and manage these difficult pathogens.